The Unitech Militags Bundle has been discontinued. No direct replacement is available. A Complete RFID Solution in a Box! A basic RFID Solution in a box that meets all Department of Defense RFID shipping requirements according to MIL-STD-129P. Use your own barcode printer to print the military shipping label, attach a second RFID label, and encode with the handheld encoder. The entire process takes only a few minutes. 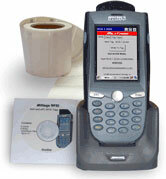 The Militags handheld RFID sysem also enables you to meet Wal-Mart EPC RFID guidelines. Kit includes Unitech PA962 PDT with laser scanner, RFID Reader/Encoder with antenna, Windows CE and charging and communications cradle, USB cable and US power supply, Militags RFID software with 1 year free support, 500 Class 1 Gen 2 RFID tags (4"x6").